In A Closed Ohio Factory, Romney Reminds Voters, 'It's Still Empty' : It's All Politics GOP front-runner Mitt Romney is matching President Obama's appearance in the key swing state of Ohio while intensifying his rhetoric, attacking the president's record on the economy. And for the second day in a row, Romney is using his location on the campaign trail to convey a message. A campaign worker hangs a sign at a campaign stop for Republican presidential candidate Mitt Romney in Lorain, Ohio, on Thursday. GOP front-runner Mitt Romney is matching President Obama's recent appearance in the key swing state of Ohio while intensifying his rhetoric, attacking the president's record on the economy. For the second day in a row, Romney used his location on the campaign trail to send a message. On Wednesday, the GOP front-runner visited Charlotte, N.C., offering a "prebuttal" to the president's speech there later this summer at the Democratic National Convention. Today, Romney spoke at a closed gypsum factory in Lorain, Ohio, the day after the president visited a community college there. 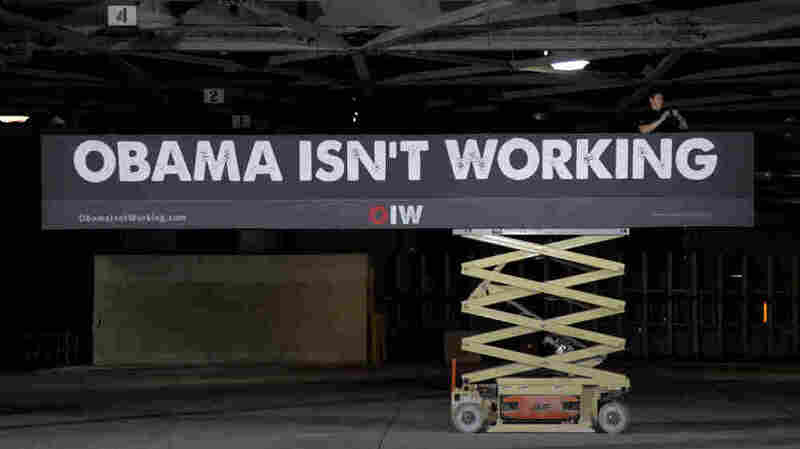 Speaking in front of a sign reading, "Obama isn't working," Romney said: "This factory is empty. It was closed in 2008 at the beginning of the economic downturn. Had the president's economic plans worked ... it'd be open by now. But it's still empty. And it underscores the failure of this president's policies with regards to getting this economy going again." During the 2008 election, Obama spoke from the same factory, promising to create jobs. Weeks later, the factory closed while President George W. Bush was still in office. While Obama wasn't in the White House when the plant closed, Romney says it remains shuttered because of the president's inability to reignite the troubled economy. "This president has failed by his own measure," Romney said. "This is a president who'd like to run on rhetoric. We instead are going to insist that he will run on record, and that record is a record of failure." The stop is part of a larger strategy by the Romney campaign to, literally, follow the president across the country, attacking Obama's economic record along the way. NPR's Ari Shapiro, who was in Lorain on Thursday, says on All Things Considered that while Obama won Ohio by 4 percentage points in 2008, it's expected to be a tougher fight this year. Shapiro tells host Melissa Block the candidates are trying to best each other in conveying the message to working-class voters, "I understand you. The other guy is out of touch." Both Romney and Obama have faced challenges connecting with working-class voters in key swing states. One statistic that may be in Obama's favor in Ohio is the unemployment rate, which has dropped from a high of 10.6 percent in January 2010 to 7.6 percent this past February — well below the current national rate of 8.2 percent.